In the early afternoon we took a bus from Kiev to Korosten, Igor’s home town. We checked into the hotel, and then took taxis to Igor’s parents’ house for dinner. 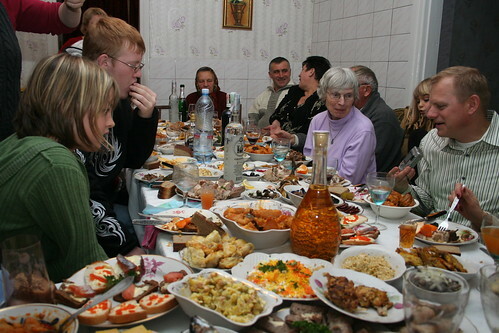 Ann had made a few small remarks about the Ukrainian feast tradition: it is customary for the host to keep the table filled with food, and to ensure that the guests always have food on their plates. 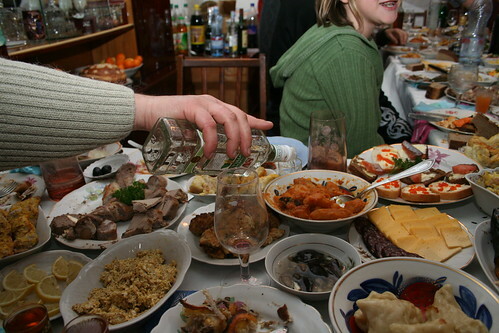 Similarly, there are a lot of toasts made through the meal, and one’s glass will rarely be empty. Ann’s words failed utterly to prepare us for what we saw, and words fail completely to describe what it was like to enjoy the feast. There’s a program on public radio that I occasionally listen to called The Splendid Table, “the show for people who love to eat”. These people have no idea what a splendid table looks like. There was – literally – no free space on the table, and yet additional dishes kept being delivered! The food was extraordinary, and we all ate so much. There was fish, chicken, vegetables, and fresh rabbit. Igor’s father raises rabbits, and he was very happy that we all enjoyed them so much. I asked, casually, how many rabbits he had, but was informed that it’s bad luck for one to count their livestock. In addition to such an abundance of food was a veritable tidal wave of booze. We started with whiskey, and celebrated toast after toast after toast. Along the way we also had their homemade wine, and a not-insubstantial quantity of vodka. In the Ukrainian tradition, we all exchanged gifts, and there was tremendous merriment and happiness all around. The feeling of warmth, love, and hospitality kept us all animated and energized for a very, very long time. Ann and Igor were clearly exhausted from their duties as the only translators at the event, but they were clearly having at least as much fun as the rest of us. Their faces were filled with smiles through the entire evening. I thought I’d seen feasts before. I thought that some of the Thanksgiving tables mom prepared when I was a kid were things of glory. These all pale in comparison to the feast we had at Igor’s parents!